Homeownership has long been central to the American Dream. Our homes are where our families and futures are built, and the single most important measure of an individual's ability to build wealth. Homeownership is, however, becoming a pipedream for many Americans. More and more of us are forced into a never-ending cycle of temporary housing because of the financial strains of a slow-growing economy and a staggeringly inequitable culture of wealth generation and accumulation. People of color remain farthest from achieving this part of the American dream. The homeownership gap is commonly attributed to a potential homeowner's level of education. However, contrary to this notion, an analysis of PSID data (https://psidonline.isr.umich.edu) analyzed by the Insight Center for Community Economic Development in partnership with Trina R. Shanks and Sharon Simonton, reveals that educational attainment is not a primary barrier to homeownership. In fact whites who hold just a high school diploma are more likely to become homeowners than blacks who hold a college degree or higher. 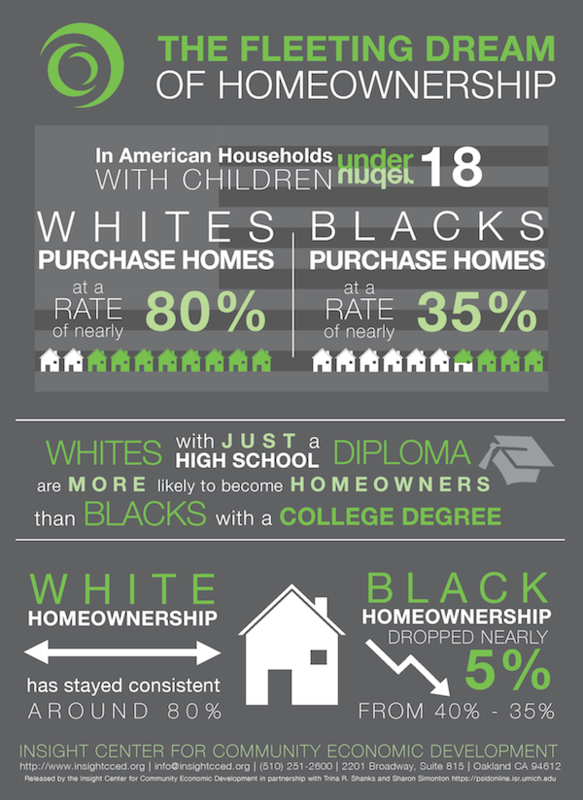 Among American households with children under 18, whites are purchasing homes at a rate of nearly 80%. Latino homeownership saw a steady increase in the years prior to the Great Recession, but decreased sharply during the foreclosure crisis resulting on only a 5% increase in their rate of homeownership between 1999 and 2011. 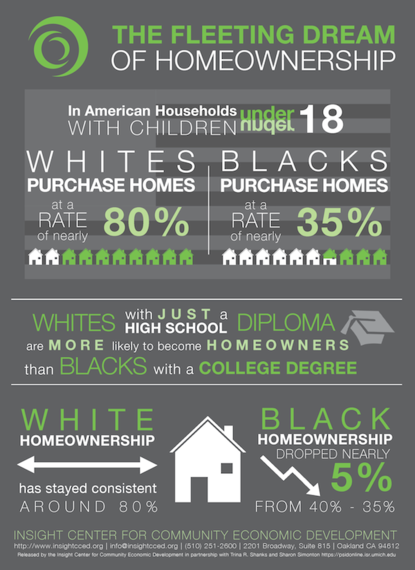 By contrast, black homeownership has fallen 5% in the same period and remains steady at less than half that of whites. This in spite of an increase in educational achievement, again calling into question the assumption that more education directly correlates with increased asset accumulation. America's homeownership divide is not only a problem in and of itself, but a symptom of many other obstacles to wealth accumulation that disproportionately affect America's black population. One explanation of the inverse relationship between increased education levels and homeownership among populations of color has to do with student loan debt. Demos found that while 65% of white students take out student loans with an average borrowed amount of $24,742, 80% of black students borrow an average amount of $28,692. For students looking to pursue higher degrees the situation is only exacerbated. The mounting educational debt becomes a barrier to purchasing a home or accumulating wealth. When coupled with the equally overwhelming costs often associated with early family life, such as childcare, student loan debt can mean the difference between financial stability and a perpetual cycle of financial stress. These young graduates' financial struggles aren't just weighing heavy on their families and immediate communities, but the US economy as a whole. A recent report by Demos, At What Cost: How Student Debt Reduces Lifetime Wealth, estimated that 39 million Americans are carrying student loan debt. This debt slows our national economy, limits homeownership, and creates a disparity in wealth accumulation that continues to widen the racial wealth gap in America. Franklin D. Roosevelt said, "Democracy cannot succeed unless those who express their choice are prepared to choose wisely. The real safeguard of democracy, therefore, is education." What then, can we as Americans accomplish in a society that penalizes students for their years of educational achievement? This is a guest post by Gabriela Sandoval and Anne Price of the Insight Center's Closing the Racial Wealth Gap Initiative.